Vedalam succeeds to grab a Top 3 spot in the chart. As the theatrical release approaches, the Aircheck numbers will shoot up. Vedalam does it in double quick time! Thala Ajith in dual roles in Vedalam? Will Vedalam repeat the Villain, Attahasam magic? When would Vedalam’s trailer be out? Exclusive: Vedalam teaser not from tonight! Vedalam aka Vedhalam is a Tamil movie with production by A M Rathnam, direction by Siva, cinematography by Vetri, editing by Ruben. 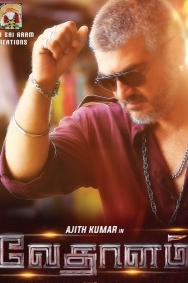 The cast of Vedalam aka Vedhalam includes Ajith, Lakshmi Menon, Shruti Haasan, Soori.